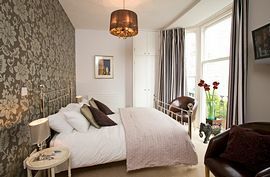 Whitburn Lodge is a family run, 4 star, Silver Award winning, Bed and Breakfast located in central Brighton; the house in an elegant terrace of period townhouses, just minutes away from the sea front, Brighton's main Conference Centre, independent boutique shops, restaurants and bars. 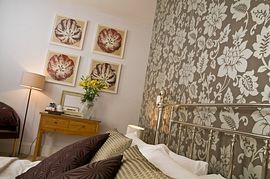 Our aim is to create a warm, friendly and relaxed atmosphere, for you to enjoy in one of our light, stylish bedrooms. Whitburn lodge is the ideal location for a seaside weekend break, a theatre trip, exploring the lanes or for a business trip. 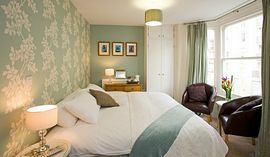 We are also within easy reach of Hove, with it's elegant regency architecture, buzzy bars and restaurants; walk to Hove Lawns, the perfect spot for a picnic; it is also the venue for the French Market, which visits Brighton regularly. Beachside bars, restaurants, clubs and funfair, are all within easy walking distance; watch street performers and artists, whilst seated at a beachside cafe with a fresh coffee, a beer or a glass of wine. Special Diets Provision: Special diets are catered for. Vegetarian/Vegan/Gluten Free. Brighton is well connected to the UK rail network. Direct services run from London Victoria and London Bridge taking less than an hour and trains run every 30 minutes. There are direct services from Birmingham (3hrs 30 min), Manchester (6hrs), Edinburgh (6hrs 30 mins) and Cardiff (3 hrs 40 mins). 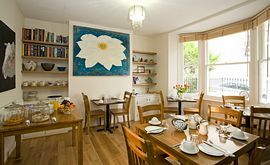 Whitburn Lodge is a short taxi ride, or if you are feeling a bit more energetic, a short 15-20 minute walk. After exiting the station proceed directly down Queens Road. At the Clock Tower where Queens Road intersects with North Road and Dyke Road, turn right into Dyke Road. After a short distance veer left into Western Road. The Churchill Square Shopping Centre is now on your left. Continue along Western Road, which is full of a variety shops. Turn left at the next cross roads into Montpelier Road, Waitrose is on the right. Whitburn Lodge is number 12 on the right just before Sillwood Street crosses Montpelier Road. London Gatwick Airport is 40 minutes from central Brighton by car, coach or taxi, or 30 minutes by train. London Heathrow Airport is a 90 minute journey by car, coach or taxi or two hours by train via central London. From the M25 exit onto the M23 at Junction 7. Continue straight ahead on the M23, which becomes the A23. As you approach Brighton, at the first large roundabout, take the first exit, signposted A27 Worthing. At the next roundabout take the first exit onto the A27. From the A27 take the Hove/Dyke Road exit. At the roundabout take the 2nd exit, Dyke Road Avenue, and follow all the way to Seven Dials. At the Seven Dials roundabout take the 4th exit onto Vernon Terrace. Keep straight on and the road name changes to Denmark Terrace and then Montpelier Road. After crossing Western Road at the lights you will find Whitburn Lodge on the right, 3 houses before Sillwood Street crosses Montpelier Road. 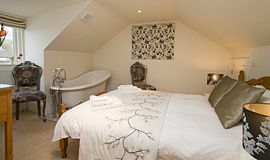 £85.00 - £135.00 per room per night.